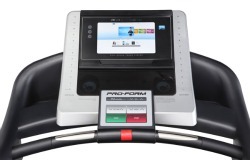 The console on the ProForm Trailrunner 4.0 treadmill has a 10" display screen with access to Google’s Android browser. Using this Internet capability, you can expand your workouts by downloading virtual city streets, National Park trails, even marathon routes, from all over the world. 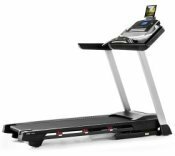 The ProForm Trailrunner 4.0 treadmill has 32 pre-set workout programs including 8 speed, 8 incline, 8 high intensity (combine speed and incline), 8 calorie burn workouts, plus Manual. A Workout Intensity Control lets you adjust any program to your preferred intensity level. *requires iFit Live wireless adapter (sold separately). UPDATE: The ProForm Trainlrunner 4.0 is no longer available. To find a comparable treadmill check out the new full lineup from ProForm on the company site to see which model appeals to you. 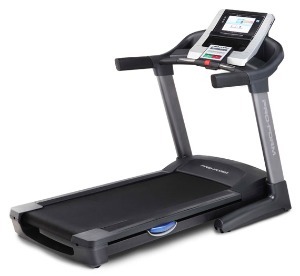 The ProForm Trailrunner 4.0 treadmill has the best technology ProForm has ever put into its cardio machines. It has a balanced drive system featuring a large 3.8 CHP Mach Z™ Commercial Pro Motor for serious running workouts. The 2-ply commercial-grade tread belt is quieter than a standard belt, and the deck features the ProTech Advanced™ Adjustable Cushioning system. The ProForm Trailrunner 4.0 also has an adjustable workout fan, 20" x 60" running area, 350-lb user weight capacity, heart rate monitoring, and programs that automatically adjust the speed and incline settings. The 10" Touch Screen display comes with a built-in browser so you can connect to the internet using your home’s wireless network to surf, read emails, watch videos, and log on to review your personal stats at iFit.com. The ProForm Trailrunner 4.0 full color display works great with Google Maps™, and the iFit Live programming lets you do fun and challenging workouts while following the coaching tips provided by pro trainer Jillian Michaels. Since iFit is fully customizable, you are free to select a course online or draw your own map – even run the streets in your own neighborhood! At $2999, the Trailrunner 4.0 is the most expensive of the ProForm treadmills. The company makes very competitive models at the $1000 to $1500 price range; but reviewers are cautious about recommending a $3000 ProForm machine. The company is not known for making specialty treadmills. Nevertheless, consider $2999 as a starting point and expect this model to go on sale at some point in the near future with big savings of at least $500 or more off the retail price. While it is true that the ProForm Trailrunner 4.0 treadmill is the best model ProForm has ever made, for $2999 we would go with a True or Vision treadmill rather than a ProForm.